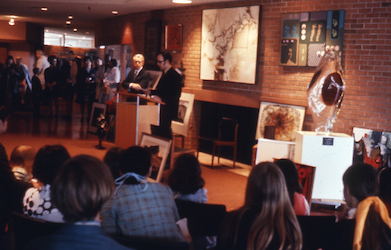 In celebration of 50 years of excellence, art from The Prairie School and The Racine Art Museum (RAM) will be featured at the RAM. Check out a recent highlight from The Journal Times. “Kindred Collecting: Exploring the Artworks of The Prairie School and RAM” opens Sunday, Feb. 15, at the Racine Art Museum, 441 Main St. This one-of-a-kind exhibition represents an atypical parallel in the contemporary art collections of an internationally known art museum and a preparatory school. Racine Art Museum and The Prairie School have been the beneficiaries of donors who believe that art is a powerful tool and important to a well-rounded education. The exhibit is a dialogue of work from Prairie’s collection paired with pieces from RAM by the same artist or one working in a similar manner. The exhibit continues through June 7. Hours are 10 a.m. to 5 p.m. Tuesday through Saturday, and noon to 5 p.m. Sunday. Admission is $5 for adults, and $3 for youth ages 12-18 and seniors 63 and older. There is no charge for ages 11 and younger. This entry was posted in All News, All School, Featured by Communications Department. Bookmark the permalink.